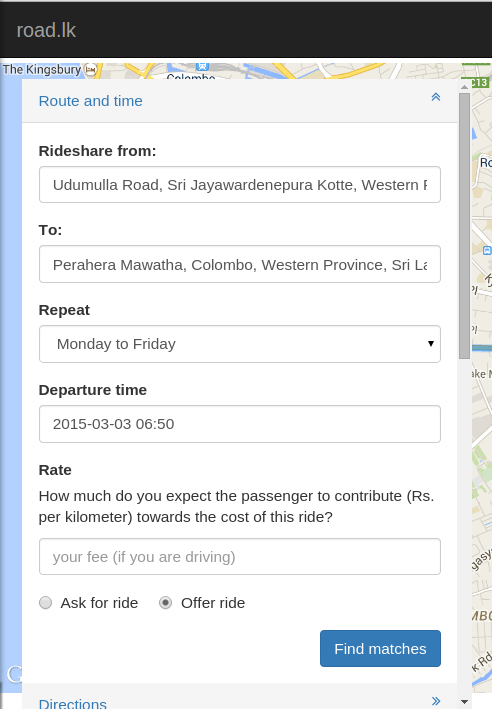 At Road.lk , we have just released our dynamic carpooling service. One that would allow you to share a ride anywhere within Sri Lanka. The idea is to match someone who would normally catch a bus, train or taxi, with a person travelling with empty seats in his car. The passenger get’s to travel in greater comfort and safety while the car owner gets to recover a part of his travel and vehicle maintenance cost. Sharing a ride is really easy. Login to our website and enter your starting location and destination. The system will work out the route to the venue and save it in a database. Our software compares your route with entries that have already been saved. Once we find a route that overlaps with yours, we compare time frames. If they are compatible, you have a match! In fact you are likely to see many matches. When selecting a ride; you can choose to maximize the overlap, minimize the cost or choose to travel with someone known to you. But first you can use the road.lk messaging system to communicate with potential rideshare partners. Use it to discuss and clarify details such as the exact location of the pick up with your ride share partner. If a matching ride isn’t immediately available, we will keep looking. Each time another users adds ride, we will compare it with yours for suitability. If it matches, we will send you a notification. You can either ask for a ride or offer a ride in your own car. When you offer a ride you can charge the passenger for the lift. We collect the payment from him or her and transfer it into your online wallet at road.lk. From your wallet you can withdraw funds into your bank account at any time. Other than the obvious financial benefits, carpooling helps to reduce traffic. How? We are taking cars and tuk tuks off the road. If the number of vehicles on the road is reduced by even a small number, a dramatic reduction in traffic is the result. That's why the morning rush hour doesn't seem so bad during school holidays. By sharing your ride, you are reducing environmental pollution while also helping your country cut down it’s import bills. See the FAQ or contact us you have any questions.